My debut novel, titled Along the Way Home, is now available in both ebook and print formats. A breathtaking account of courage and adventure along the Oregon Trail. Travel this dangerous journey with characters you will treasure as they cope with heart-wrenching difficulties they never thought to encounter in a search to fulfill their hopes and dreams. 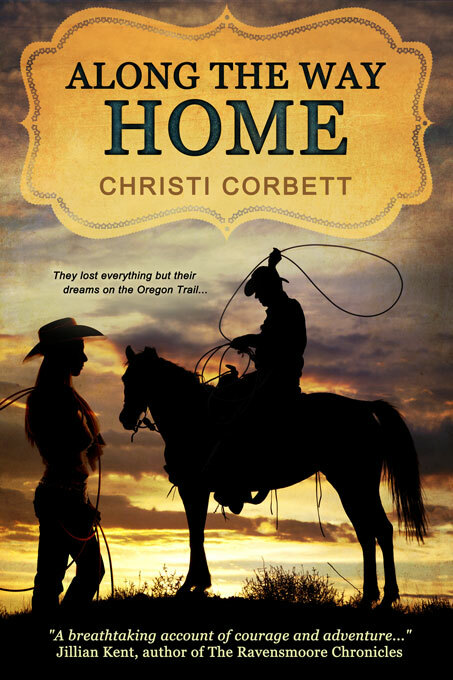 Christi Corbett’s debut novel, Along the Way Home, will both surprise and delight. A dash of action! A touch of intrigue! Loads of sweet, clean romantic promise–a chick flick 1840’s historical western that will tickle young adults and ladies! After having the opportunity to read a portion of Christi’s upcoming novel, Along the Way Home, I must say I was left waiting for more! The description and detail wrapped within each line creates a sense so deep you feel as if you were there – as if you can actually feel the velvet softness of the main character’s dress, see the carvings within the banister of her home. It will be a great addition to any readers collection and I cannot wait to read it in full! This sounds like a very interesting book. The tidbit leaves you yearning for more. Can’t wait to read the book. Cant wait to read more! This has captured my attention and I deffinatly want to read the rest of this story. Thank you for sharing. Nice work Christi. I’ll be looking for your novel when it is published. I do expect an autographed copy you know. Christi–This is simply amazing. You have a way of painting pictures with your words. I’ve seen the trailer and read the blurb, now I want so much more. I want the whole thing. “Along the Way Home” is a home run. If the manuscript is ready it’s time to query. I don’t know where you’ve considered or if you have an agent but get ready for big things. I am so glad you found me on Seekerville. I LOVE it! I’m already rooting for Kate! I want her to kick Aunt Victoria’s overstuffed tuchus! This is excellent, Christi. After reading the first 500 words, I was definitely intrigued; now I’m just floored. I love that Kate is unafraid of Aunt Victoria and is confident enough to say what she thinks, even if it’s outside the norm. And your descriptions of Aunt Victoria’s mannerisms are awesome! I would love to have this book in my hands right this minute! Having heard several parts of this book in our writers group, and followed Kate on her adventure, I can assure everyone that the rest of the book is every bit as good as this beginning! It will be well worth the read. Very nice! Dialogue is smooth and flowing. I can feel the tension between the two, something that is hard to build sometimes in short paragraphs. I look forward to reading more!